The Year 4 teacher for this year will be Mr Brocksom and he will be assisted by Miss Shillito. We set homework, weekly, on a Friday and expect in on a Tuesday. We have a weekly spelling test which will be on a Friday afternoon alongside a multiplication/ division test. Please ensure that homework is completed in pencil as part of the expectations set at school If you are drawing straight lines, you should use a ruler. Keep it neat and set yourself high expectations. 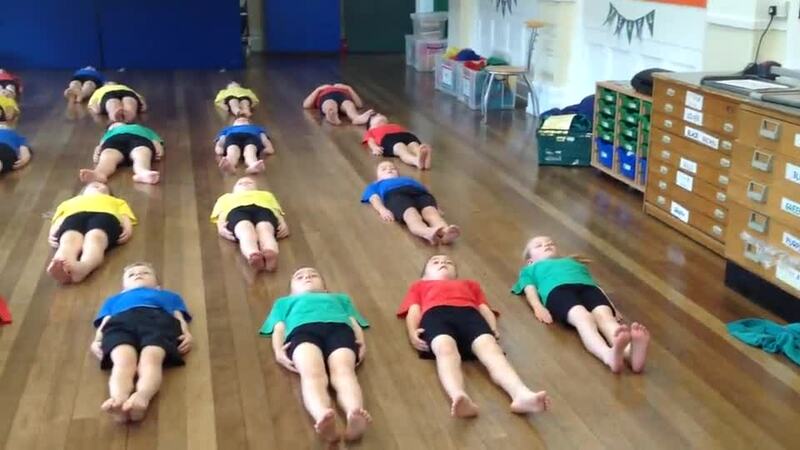 The Year 4 PE days are Wednesday and Friday. This half term, we are learning the skills needed to play football. Also, as part of our indoor sessions, we are looking at a range of multi-skills and having an in-depth look at agility, balance and coordination. We will link this in to a variety of games including bench ball, dodgeball and quidditch. In Year 4, we will shoot for the moon but if we miss, we will still land amongst the stars. In Topic, we have been learning about Ancient Greece. We have been completing loads of written work about Sparta and Athens. Recently, we have begun our art work which relates to Ancient Greek theatre masks. We have been building our skills up by creating different facial features using papermache. Over the next 2 weeks, we will be designing, creating and evaluating our own theatre mask. For the pictures, please visit the Facebook page. This year, we all dressed up in non-uniform in order to raise money for children in need. We raised over £200 as a school and here are some pictures of our children. Who do you think looks the best? Who do you think looks the best? For the past 2 weeks, we have been creating "Sound Collector," poems in English. We have been working in groups and learning about rhyme, syllables and rhythm. We have a few action shots from today's lesson. Hopefully, on Friday, we will perform these and upload the videos onto the website. As previously stated, we are going to be increasing the amount of photographs that go up on our blog. Sorry for the wait. We have taken some photographs of us completing our multiplication grids, editing and improving our work and shooting in football. Hope you enjoy them. Thank you for voting in our recent poll. With 4 votes, photographs was the winner. Next week, we will be adding a variety of photographs of us learning and having fun at school. Keep posted for more great photographs like this. What would you like to see on our new Year 4 blog? Hello and a warm welcome to our Year 4 class page. Our class teacher is Mrs Hebron and our teaching assistants are Mrs Richardson and Miss Mills. Our PE days are Monday and Wednesday. We change our books on a Wednesday. Please ensure that your child has read their book and their journal has been signed. Homework will be given on a Thursday including spellings to learn for a test on Wednesday. Homework should be handed in the following Monday in time for it to be marked and rewarded in class. Today, we have had a great Habitats Day! We started by researching how animals survived in their chosen habitat and used this research to create our own animals. Then we wrote a fact file all about our animals and created a labelled picture to show what it looked like. This afternoon, we have had so many different activities to do. We have tried exotic fruits, gone pond dipping, had our faces painted and created an animal mask to take home. Here are a few pictures from today although we didn't take lots because we were all too busy having fun! Today year 4 went the RSPB nature reserve at Dearne Valley Old Moor. Despite it being a hot day, this didn't stop the children learning lots about creatures that live in different habitats around the reserve. Here are some pictures from our day. This week, we have been creating our very own habitat boxes in class. The results are fantastic and I would love to share them with you here. Today, the children in year 4 were treated to a real life referee coming in to do a workshop, Darren England himself! The workshop began with a talk from Darren England and him showing all his referee kit and equipment. The children were amazed at the amount a referee has to have during the matches. Then, the children took part in a 'Dragon Den' activity where they created or improved equipment that a referee uses to help them. The ideas the children created were excellent and Darren said he would definitely be taking some of them back to his bosses! Thank you Darren for such a fun and interesting afternoon. Last term, our novel study was the brilliantly fun story written by David Walliams, Gangsta Granny. The children loved reading this book and we are still enjoying the final few chapters. During English lessons, the class wrote their own story where granny stole another jewel for her ever growing collection! Their writing was fantastic and very imaginative. Also, the children decorated their own dazzling jewels during the snow week last term. Their work was so fantastic we had to display some of it. Below is a picture of our Gangsta Granny display in the KS2 hall. There is still lots of work to go up on our Wonderful Writing display in class too! Last week, we began our new topic in year 4- habitats! The children were really excited to start learning about this topic, especially after our two history based ones this year. We started with lots of class discussion about what a habitat was and what animals belonged to each habitat. After collecting their ideas for our working wall, I was amazed at all the interesting facts and information they already knew! As the week went on, we build up our wonderwall which is now full of excellent questions to answer this term. I can't wait to see how year 4 do over the full term, they are sure to become habitat experts! A big well done to the TWO winners in year 4 for the wooden spoon competition. Your excellent designs and hard work paid off! A big well done to all children who took part, you really did produce some excellent characters. This half term our novel study is Gangsta Granny. The children have enjoyed reading this new book and will be completing a piece of writing next week. Some pieces of work will be going on display. To help make our display even better, the class have designed and created some jewels to go around the outside of the display. Watch this space to see the completed display! Here are some photos of the activity. During this half term, internet safety has been our focus in ICT. The children have considered different scenarios faced on the Internet and how to solve them safely. Also, they have completed quizzes and games linked to internet safety as well as researching what they can do to keep themselves safe online. 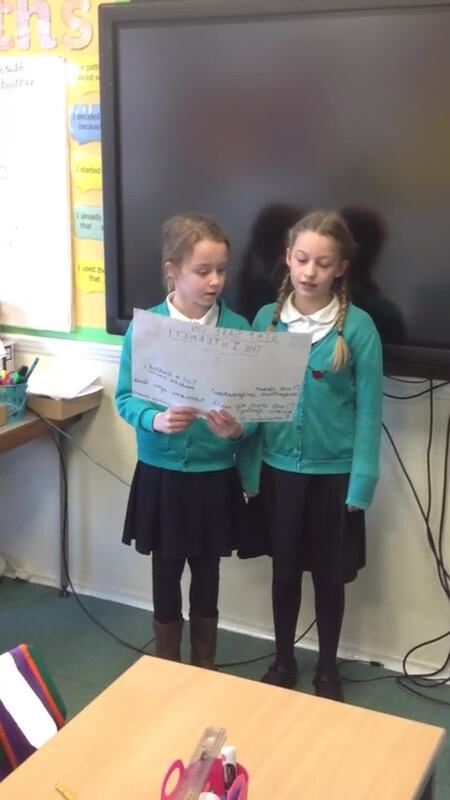 Last week, they used all their learning to produce a poster where they talked about E-safety. Below are a few of the presentations made in class. Today in topic we learnt about the rebellion led by Boudicca and the Iceni tribe. The children then got into role as different characters that were effected by the rebellion. Below are some videos of them in character, answering questions about what different aspects of the rebellion did to them. Our new topic for the Spring term is the Romans. Already, we have learnt a lot about who the Romans were and what they did. Year 4 have also made their own Roman shields! The children would like to tell you what they have been learning. Bronwyn said, "Their shields give Roman soldiers power and makes them feel stronger!" Charlotte said, "The shields are made by very special artists called craftsmen." Norah said, "Very rich people had mosaics in their homes to show their wealth." Mckenzie CW said, "We have learnt that the Romans took over Britain but it took them three attempts!" Emily said, "The Romans fought the Celtic tribes that lived in Britain." We look forward to learning more about the Romans! This week the class spent a few minutes thinking about their goals for this year. We started by talking about goals outside school and these including everything from achieving a new belt in karate to eating healthier foods. Then, we discussed resolutions for learning and what the children would like to achieve at school. Below are videos of these resolutions. We have been really busy in year 4 the last couple of weeks and have been getting everything ready for the Christmas Craft fair, we hope you liked our crafts! Whilst we have been busy performing in the carol concerts, we have also been busy with our learning. In English, we have begun reading the Christmasaurus and have completed lots of interesting pieces of writing linking to this fantastic book. At the moment, we have been practicing our rhyming skills in preparation to write our own rhymes- just like the North Pole Elves. Next week, we will be writing a description of our own Christmas Dinosaur. In Maths, we have been learning how to tell the time and how to convert analogue time to digital time. Later in the week, we will be converting 12 hour time into 24 hour time. The children are keen to improve their skills with time and some have talked about starting to wear a watch so they can practice telling the time more often. Today we visited the Magna Science Adventure Centre and it was brilliant! The children had lots of fun discovering the different activities within the four pavilions- earth, water, fire and air. Then, we all took part in a volcanoes and rocks workshop which developed understanding regarding eruptions of volcanoes and classifying rocks. Behaviour was excellent as always. Below are some pictures that we took throughout the day. In year 4 we have been doing lots of different things to help improve our understanding of what bullying is and what we can do to make sure it doesn't happen. Children worked in groups to look at different bullying scenarios and talked about why the bullying was happening and what we could do to stop it. Then, we talked about what personality attributes we looked for in a good friend before making a recipe to create a good friend. The children included respect, honestly, resilience, loyalty, trust and kindness in their list of ingredients. Norah said, "Bullying is both verbal and physical." Eloise said, "It's when someone is unkind continuously to somebody else." Amelia said, "It's when unkind behaviour is planned." Alfie said, "When people purposely go out of their way to hurt someone everyday." Today we began our new topic- 'Volcanoes and Mountains'. To kick start our new topic we watched a short video of a real life volcanic eruption and created a piece of music in small groups to represent this event. The children used their knowledge of rhythm and layering from previous lessons to build up the sounds. Below is the result. Fantastic teamwork skills year 4! At the beginning of our dance unit I posted a video of our chorus. 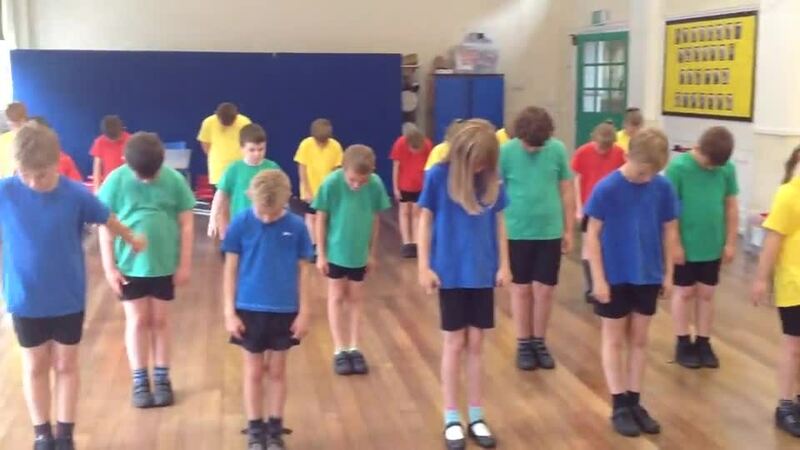 Since then, year 4 have continued to build on their routine as a team and have created a dance that really fits with the lyrics of the song. Their idea was to create a dance where monsters woke up and then at the end went back to sleep. Below is the finished product, we hope you enjoy it! Today, year 4 went on a trip to Weston Park Museum and as you can see in the pictures below, we had a fantastic time! Everyone really enjoyed the interactive activities within the museum and had great fun building our own Parthenon during the workshop in the afternoon. The children really impressed staff at the museum with their knowledge of Ancient Greece and the class were exceptionally behaved all day. This half term our novel study has been James and the Giant Peach. Today the children made birds to add to our new display in the KS2 hall. Here are some pictures of children taking part. Watch this space for pictures of the completed display. This week we have been learning about the Greek Myth 'Hercules'. We watched the Disney adaptation and then read the written version. Next week we are going to be investigating the similarities and differences between the two versions and using this to write a comparison text. Today we began our new novel study in Guided Reading- James and the Giant Peach. The children found the first few chapters very funny, especially the parts about Aunt Sponge and Aunt Spiker. Here are the children during some partner reading. This week we started dance in PE. Over the next few weeks the children will help to create their own choreography to the song 'Monster' by the Automatics. 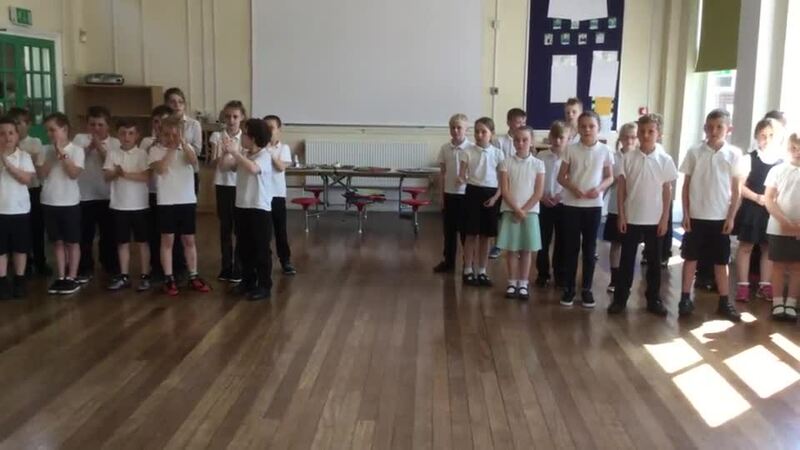 This lesson, the children worked in groups to make a 5 move routine for the chorus. Then, we put ideas from each group together to finalise our moves for the chorus and even included some monster freestyle! Have a look at what the children created. This week in Maths we have been improving our rounding and counting skills. To help we have been using number songs in class to make counting up in 6s, 7s and 9s fun. The videos are posted below so that you can practice at home. This week we have begun our Fiction unit in English. Over the next three weeks we will be learning all about myths, the structure used to write them and the language features that we need to include. Today we focussed on the structure of a myth during a role play activity. First, we looked at the myth 'Theseus and the Minotaur'. The children worked out what information belonged to which section. Was it the introduction, build up, problem, resolution or ending? Then, the children worked in a group to role play a section of the myth. This was year 4's first attempt at role playing and working together in this way and I was really impressed with the team work and discussions going on in class. Below are the videos of each group's role play. This week was our final swimming lesson at Royston Baths. For the last 15 weeks of swimming lessons the children have tried their best and have all made progress with their swimming skills. Below are some pictures of some of the children with their awards. This afternoon, year 4 have entered a competition to create their own habitat. We started by filling in a survey form of the area we were planning for and then we discussed all the different things we could place in our habitats to encourage different animals to live in our school grounds. We really hope to win the competition and hopefully build one of our designs for our school. This afternoon all children in KS2 took part in a fun activity. We started by talking about the general election and what it meant and then in groups the children created their own political party. They thought about what was important to them and what they needed to solve in their town and the UK. All of the children worked brilliantly together and came up with some great ideas. One group decided on a 'Communication Party' where everyone had limited time on the computer and had to dedicate time to talking instead. Another group created a 'Giving to the Community' party that argued that everyday people should do a good dead to make people smile. Some examples of their ideas are below. This week year 4 had lots of fun in music. We started by listening to Perpetuum Jazzile's choir and how they used their hands and bodies to make music. We then discussed how the music started soft and quiet and then built up. Then we created our own piece of music. 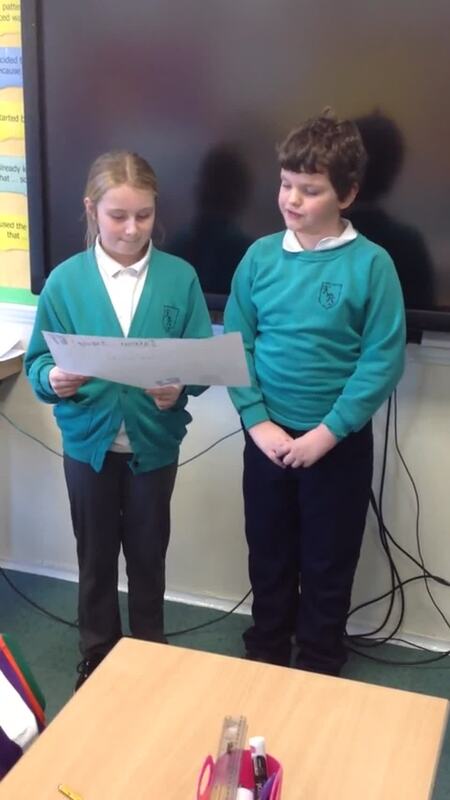 Year 4 worked really well and we decided to film what we had made. We hope you like our 'Rainforest storm' piece. This week we have begun learning about limericks in our English lessons. We started the week by focussing on the key features of a limerick and what makes it different to other forms of poetry. Then the children had a go at writing their own Limerick and focussed their Limerick around an animal. Below are short videos that show some of the examples. Next week we hope to write a set of limericks that contain some tricky language features. Our topic this term is ‘Habitats’. We have been researching different types of animals and the different habitats that they live in. One of the habitats we have looked at is a pond habitat which is great because we are lucky enough to have one in school! In English we introduced the scenario that there were plans to take the pond away and replace it with a playground. Year 4 were horrified and thought about all the negative consequences this would have for us and the plants and animals that rely on the pond to survive. Therefore, we decided to write a letter to convince the Mayor of Barnsley to have a rethink. The children in year 4 have produced some really persuasive writing which includes lots of different language features. Today we went to see the spectacular show ‘Gangsta Granny’! It was fantastic and year 4 were really impressed with all the cast for remembering all of the lines from the book, the staging and props and the brilliant dancing. “My favourite part was when all the children were asked to dance along at the end.”- Tara. “My favourite bit was when Gangsta Granny did naked yoga!”- Evie. “My favourite bit was the Christmas scene at the end.”- Terrianne. “My favourite bit was when Granny and Ben were having a nice talk in the hospital.”- Brodie. “My best bit was when Granny and Ben were breaking in using the drill to get to the crown jewels!”- Aaron J. “My best part was when Ben was about to break the glass but the Queen appeared.”- Oliver F.
As always, behaviour on this trip was superb. All the children in years 4 and 5 did Kexborough proud. We hope all the children enjoyed it. For our warm task in English, the children have been writing their very own newspaper report all about Boudicca's rebellion. I have to say that this is the best piece of writing I have marked and it made me very happy to give lots of greens in books and lots of 'great' and 'excellent' stamps. To everyone in year 4, have a lovely break and enjoy the sunshine (hopefully). This week the children in year 4 have been learning all about co-ordinates and 2D grids. We started the week learning how to read co-ordinates and spotted mistakes along the way. Next, the children learnt how to describe the movement between points and used their reasoning and problem solving skills to explain the patterns in movements. Then, we learnt how to plot points and join them to create polygons. Finally, in today's lesson the children put all of their knowledge of shape and co-ordinates together to create their own instructions and find missing co-ordinates. I am really pleased with all year 4's attitude towards Maths this week. Today we celebrated Red Nose Day in school. The children dressed up in red and brought in a joke or funny poem to read out in class. Later in the day, the children performed these jokes. All of them were brilliant and two were chosen to perform later in assembly. A big well done to all the children in year 4! For homework, over half term, year 4 had a fun and exciting job to do! They were asked to make a Roman fort or a building found in a Roman fort. This morning we arranged their creations into a Roman fort and took some pictures which are shown below. We have had a fantastic, creative day in year 4 and have focussed all our learning on the book 'Spy Toys'. In the morning we looked at the book which is full of extraordinary toys that are all created by Professor Snaztacular Ultrafun. These toys have brains and personalities and can all do different, amazing things. We meet a bear called Dan who is programmed for cuddles and hugs children when they are upset as well as fetching them a glass of milk and reading stories. Then, the children thought of their own Ultrafun toys and drew and labelled these in class, thinking about all of the amazing things their toys could do. Next, we thought about how we could advertise these toys to ensure they would be a success for the Ultrafun business. We looked at different adverts and the children worked as detectives to find the key features of adverts before creating their own advertisements for their toys. Some of these are shown below. Yesterday year 4 went out exploring for minibeasts. We thought about the places where minibeasts might hide in the cold and found spiders, ants, slugs, woodlouse and worms! We then recorded what we had found and described the habitat where it lived. This week we are going to research minibeasts further and discuss the similarities and differences between them. Last week we learnt about internet safety and how to look after our personal information on the internet. Year 4 completed an activity and created their own emoji or avatar to represent them but in a safe way. All pictures of the children’s finished work can be found on Miss MacKay’s head teacher blog. This week in Science we have focussed on what plants and animals need to survive. We started by thinking about what we knew already and then learnt all about MRS NERG to help us remember the basic needs of animals and plants. Then we made a poster for either the needs of animals or plants. Some examples are below. Today some of the year 3s and 4s competed at the relay competition at Barnsley College. It was a really successful day for everyone and to top it off we won 1st and 2nd place! The children did Kexborough proud. Myself, Mrs Frostick and Miss Shillto were really impressed with how much effort all of the children put in and also how well they worked as a team! Below are a few of the pictures from the competition. Today year 4 acted as characters in the famous Roman event, Boudicca’s rebellion. First we learnt about the different people involved and learnt some key facts about each of them. Then, the children got into groups and thought about how their character would stand, act and what they might say. They worked together to create a short role play where they said a fact or two about their character. Finally, we predicted what might happen during the rebellion and which characters might cause the most trouble. The children are excited to find out if their predictions are right in the next lesson. This week we have completed our extended write. We have written a letter from Julius Caesar to a Celtic general, arguing for peace or terms of surrender! We started the week by collecting persuasive arguments on the working wall and then expanded on these in our planning. 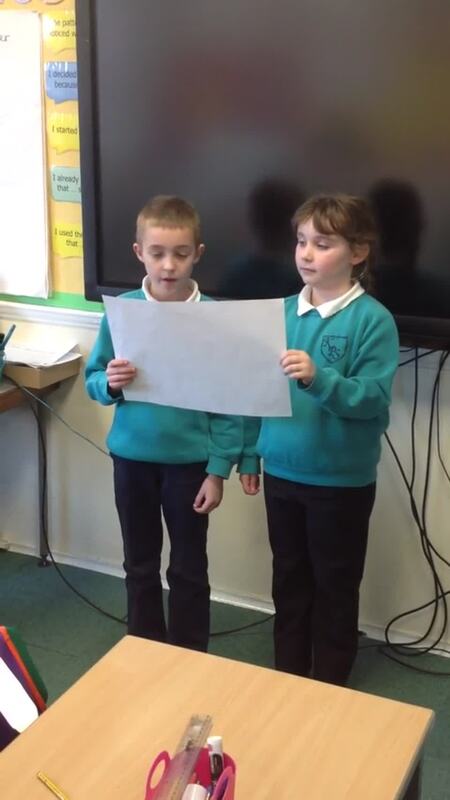 Then the children used the support given in class, to write their own persuasive letter. The children then used the success criteria to improve their work and ‘show off’ what they can do. English has been challenging for the children this half term as they have been learning about complex sentences and how to make sentences simple, compound or complex. However, I am really impressed with the progress they have made and hope this continues for our non-fiction unit focussing on the brilliant ‘Gansta Granny’ by David Walliams. This term our topic is 'the Romans', and we have already learnt a lot! In topic lessons we have looked at how the Roman empire grew and how they defeated many Celtic settlements and tribes. In Maths we have learnt about Roman Numerals. We started by learning about the pattern the Romans followed and then we read and wrote the numerals. In Art we have started to learn about Roman mosaics and how they were used as a show of wealth. We have designed our own mosaic boarder by creating a pattern using only three colours. We have had a good start to our topic and are excited to find out more! This week we went on our first trip in year 4. We had a fantastic time and learnt a lot! Our day began with a workshop, where we conducted a volcano experiment and created eruptions using scientific materials. This showed how lava erupted and cooled to form the layers on a volcano. It was really interesting and really helped us to visualise this volcanic process. Then, we explored the Magna Science centre and explored the air, earth, water and fire platforms. We really enjoyed learning about these four areas interactively, and it gave us lots to talk about. Also all of the year 4s were extremely well behaved and did Kexborough proud! Year 4 Educational visits and Events. Today the year 4s went on a full day trip to the Dearne Valley Wetlands nature reserve. Although it was a very wet day, all the children thoroughly enjoyed it and took part in lots of interesting activities. We began the day with pond dipping and discovered lots of creatures. Once we had found the creatures we used our investigation skills to identify the name of the creature we had found. In the afternoon, we went for a walk around the woodland to find the living things that lived there. We used special equipment to have a closer look! As always the behaviour from year 4 on this trip was brilliant. Have a look at some photos from our day. Today year 4 went on a very exciting trip to the Yorkshire Museum in York. We looked at the many Roman artefacts in the museum, including Roman coins and pottery. Then we went to a workshop where we explored Roman York and learnt that York was once a Roman city called Eboracum. We met a Roman citizen who explained what it was like to live in Eboracum and then we participated in lots of different Roman activities. These activities were Roman hairstyles, knuckle bones, fort building, trying on Roman armour, crushing Roman spices, solving numeral problems and creating mosaics. As always the behaviour on the visit was brilliant and all the children said they had enjoyed their day out. © 2019 Kexborough Primary School.